Be human in your posts. As a digital marketer, show that your brand isn’t some faceless, unfeeling corporate entity. Use blog content to help show off the people who work at your business, as well as your company’s personality, with the six posts described here. Some of the most effective content on the web is neither informational nor entertaining — it simply inspires. The health and fitness industries often use this approach. Inspirational posts can work well as a story post, a profile post, or a quote post, among others. Some blogs go dormant on popular holidays, but that doesn’t have to be the case. Holidays are a great way to display your company’s humanity. 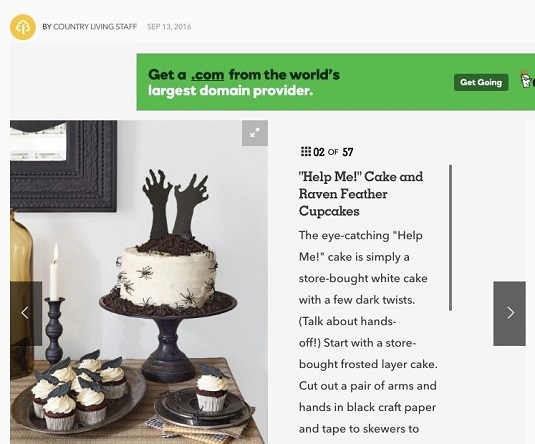 Use the opportunity to deliver well wishes and create anticipation with your audience, as Country Living magazine did with its Halloween cake recipe article. Country Living helps fans get ready for Halloween in this holiday post. You can also get creative with the holiday post; you don’t have to recognize only the major holidays. Some obscure holidays may apply to your niche, such as National Hat Day on January 15, International Talk Like a Pirate Day on September 19, or Write a Friend Month in December. In this post, the author opens up about a private moment in his or her past. Some of the best content on the web is created by a content creator who lets his or her guard down by delivering a deeply personal experience that the audience can relate to. People love to peek behind the curtain and see how something gets done. If you have a loyal following, many will want to see what goes on behind the scenes of your business. Create content around this idea. You might show a day in the life of one of your managers, or show your approach to putting a video together. In this post, provide images and videos that enhance your written examples. It is important to stay relevant to your niche. Going with the idea that any attention is good attention, you might create a post that is completely different from what you typically post on. This maneuver can be risky, but if you have a loyal following who has become accustomed to you covering a specific set of topics, this kind of post can surprise people and evoke a great response. The rant post shows your human side by revealing your passion and anger about a topic that’s relevant to your audience in an op-ed style. Although the rant post isn’t for everyone, the right blog and audience can respond well to a rant.